We're just four days away from Star Wars: The Force Awakens hitting theaters, with Disney and LucasFilm holding the world premiere today in Hollywood, California. This highly-anticipated adventure features new and returning faces from both in front of and behind the camera, with stars Harrison Ford (Han Solo), Mark Hamill (Luke Skywalker) and Carrie Fisher reprising their roles from the original Star Wars trilogy, and screenwriter Lawrence Kasdan (Star Wars: Episode V - The Empire Strikes Back, Star Wars: Episode VI - Return of the Jedi) returning to co-write the script with director J.J. Abrams. 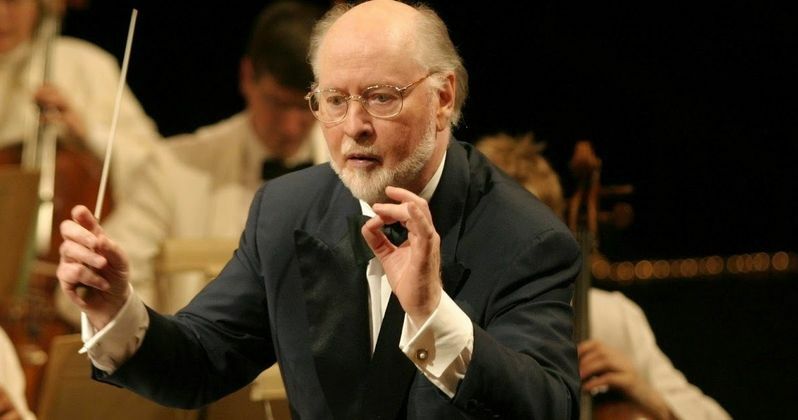 Iconic composer John Williams is also returning to provide the score, and today we have a new video courtesy of Film Score Media that shows the musician composing the theme for the film's opening scene. The seven minute video, which is part of an extended segment from 60 Minutes' piece on Star Wars: The Force Awakens, also shows director J.J. Abrams, who reveals that this music will be studied by fans after the movie hits theaters, as we get to watch John Williams compose the score. We hear from the director himself, who speaks about how having a composer like John Williams is almost like "cheating" because he "writes feelings." We do see a few snippets of footage from the movie, but we've seen these scenes before, except for one. This video gives us a tiny glimpse at a new scene featuring Rey and the ball droid BB-8. The director also adds that this part of the entire process may be the most "surreal," since he grew up listening to John Williams. Star Wars: The Force Awakens is expected to break the all time record for highest opening weekend at the box office, which was set this summer by Jurassic World, which earned $208.8 million during its opening weekend this June. Some have speculated that Star Wars: The Force Awakens could earn upwards of $300 million during its first weekend in theaters, and it has already set a record for highest pre-sales, with over $50 million in tickets sold. That record was set last month, breaking The Dark Knight Rises' record of $25 million. That $50 million tally has surely gotten bigger since then, but we don't have any updated figures as of yet. J.J. Abrams is directing from a screenplay he co-wrote with Lawrence Kasdan and Michael Arndt. Kathleen Kennedy, J.J. Abrams and Bryan Burk are producing with Tommy Harper and Jason D. McGatlin serving as executive producers. Star Wars: The Force Awakens will be followed by the first spinoff, Rogue One: A Star Wars Story, arriving on December 16, 2016. Star Wars: Episode VIII is slated for release on May 26, 2017, with Star Wars Anthology: Han Solo Movie arriving on May 25, 2018 and Star Wars: Episode IX premiering sometime in 2019. Take a look at this seven-minute video that takes you behind-the-scenes of Star Wars: The Force Awakens.